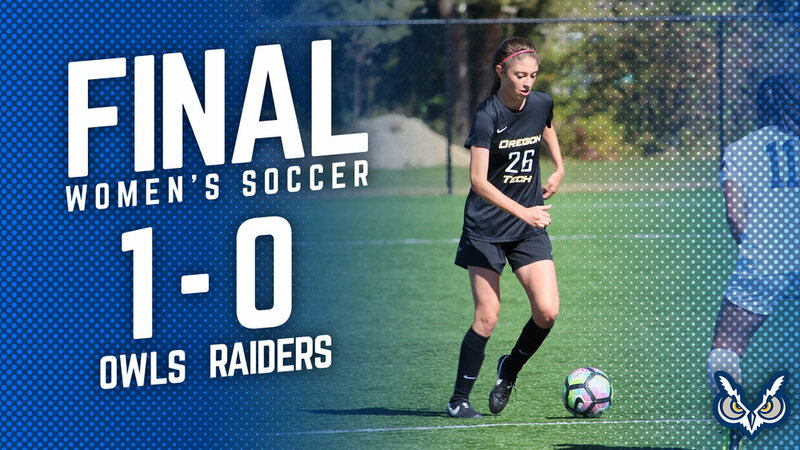 KLAMATH FALLS, Ore. - The Oregon Tech Owls Women's Soccer team (8-6-0 overall, 6-3-0 CCC) punched their ticket to the Cascade Conference Tournament with a 1-0 shutout of the Southern Oregon Raiders on a wet and cold afternoon at the Oregon Tech Soccer Field. In the 51st minute, Junior Cassidy Gosvener (Vacaville, CA) took advantage of some space at the top of the penalty area and finished a low shot for her 4th Game Winning goal of the 2017 season. The Owl defense was then able to stay strong and finish the game out to earn Senior Goalkeeper Megan Green (Albany, OR) her 5th Shutout of the season. Head Coach Brandon Porter on the team's win, "This was a huge afternoon for the program, as it marks a return to the CCC Tournament after a three-year drought as well as the first win over SOU in a long time. This game was a result of years of work and dedication from the upperclassmen, and an unselfish attitude carried by all. It's been a joy to watch this group grow and get positive results. It really is hard to point out any specific individuals as everyone is playing very well and the team's identity as a cohesive, blue collar, and hardworking group continues to solidify. Very proud of the team and looking forward to ending the regular season on a positive note and carrying that momentum into the postseason." The Owls now currently sit in a tie for 3rd place with Rocky Mountain College. Seeding for the eight team CCC Tournament is still open, but by virtue of maximum points possible with one weekend left, there are currently four teams that cannot overtake the Owls in the standings.